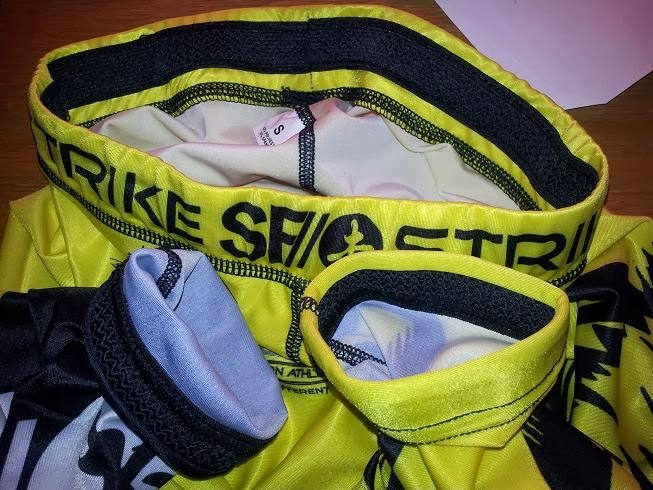 Short Review: The Mashuu spats from Strike Fightwear are a gloriously bright yellow, featuring a sublimated Meerkatsu design down the leg. There are anti-slip elasticated bands on the waist and the ankle cuffs, which personally I didn't find all that comfortable but are meant to prevent slippage. Be careful of the sizing: I went with Small, but it was much tighter than I expected (though in fairness I got used to it after a few months). I bought them from here for £15 on sale, but they will presumably be at least twice the price once (if?) they come back in stock. Full Review: As I was so pleased with my beautiful Pony Club Grappling Gear 'Jessica' spats (reviewed here, with a potted history of grappling tights), I was keen to pick up some more. Somebody on reddit mentioned Strike Fightwear were having a sale, leading me to snap up a pair of Mashuu spats back in August. The selling point for me is that the spats are bright yellow: I'm a big fan of colourful nogi equipment, in direct contrast to my preference for plain and simple gi design. The macaque design adorns almost the entire left leg, Mashuu covering the back of the leg as well. The right leg is plainer, staying yellow down the upper leg and past the knee, followed by a black section around the calf. That has 'SF//' in white text, finished with a kanji in a white circle at the very bottom. The same SF// design is repeated along the waistband, interspersed with the word 'Strike', in black text on yellow. Finally on the upper right leg, there is a monkey wearing a kabuto (samurai helmet) in front of crossed katana, with some more text below it and the Strike Fightwear logo. The monkey with the helmet was not designed by Meerkatsu: instead, it was modified from something he created earlier. Strike Fightwear started in 2011 and has since become known for offering extremely cheap gis. Based in the UK, Strike FW have also often worked with designer Seymour 'Meerkatsu' Yang, who created their Red Dragon gi along with a range of nogi artwork. The macaque was one of Yang's early designs, featured on both a rash guard and grappling tights. Dubbing the macaque 'Mashuu' was a result of a Strike Fightwear naming contest, won by another UK blogger, Will Wayland. Apparently, it is a little-used Japanese forename. Doing a quick Google, there is a Lake Mashū in Japan as well. There was no size chart on the website, which is a major problem, particularly if you're buying in a sale and don't want to risk the product selling out (otherwise I would have emailed them to check the size). I therefore decided to base my decision on the PCGG spats I already owned, given that they are a size Small and fit well (I normally wear 30 inch waist trousers, to give you a point of reference). So for me, the Mashuu 2.0 initially felt far too tight, especially the waistband. I struggled to pull that over my hips. Once it slid past my hip bones, I didn't feel discomfort (unless I pulled the waistband over my underwear and directly onto my skin), but the insufficient size was noticeable when I looked at my legs. The fabric on my legs was stretched out to such a degree that not only could I see the hair on my legs, strands actually poked through when I was cycling. I am assuming that this was purely down to the fact that the spats were too small for me, rather than the fabric itself being much thinner than that used for the PCGG spats. There was another possibility to try, which was removing the thick rubber waistband. 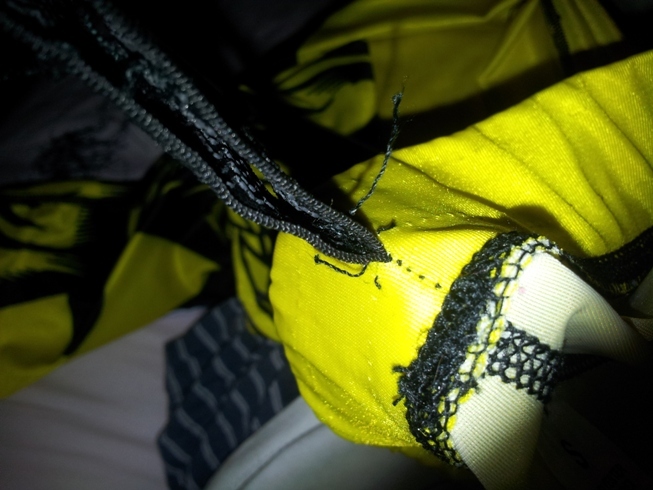 This also explained the ripping noises I had heard earlier: they were caused by the loosening of threads attaching that waistband to the spats. I cut the rest of it free, a simple process until I got to the heavily stitched main join between the band and the spats. That thin strip at the back was too entwined with the spats to remove all the threads, but I could still cut it off with some scissors. This resulted in a much more comfortable fit, although of course that doesn't help the material straining on the legs. Having said that, I'm now used to them after four months of use, to the extent that my PCGG spats actually feel a bit loose. I have also since bought a pair of spats that feel even tighter, but I'm hoping that like the Mashuu spats, they will begin to feel looser after continued testing. In terms of specific measurements, when the Mashuu grappling tights are lain flat on the floor unstretched, the waist is 10 inches (26cm) wide. From top to bottom they are 82cm long, while the ankle openings are 10cm wide. Needless to say, there is a lot of stretch: I wear 30 inch waist trousers and can wear these without discomfort, despite my initial concerns when I first tried them on. According to the inner label, the construction is 82% polyester and 18% spandex. The anti-slip bands are supposed to stop the leggings from shifting up or down. I did not like the feel of the waistband, hence why I removed it, but that may have been down to tightness rather than the anti-slip ridges. I left the anti-slip strips on the ankle cuffs: they do a decent job of stopping the tights from riding up my legs, of particular use if you're rolling in spats and a rash guard for nogi. I rarely train nogi myself, but always wear a pair of spats underneath my gi trousers. That's partly for warmth, as the venue where I currently train is quite cold, but I have also found the compression helps relieve the niggling groin injury I've had since last September (I've been to two different physiotherapists since then, so it's possible that's more psychological at this point). As with any pair of spats, the tightness takes some getting used to: I don't mind a really snug fit, but you will want to choose your size very carefully. If you have no issues with a tight fit and are a similar size to me, then the Mashuu in Small should work, but a Medium is probably a better bet for the average person. It is a good idea to contact the supplier with your measurements, though even then you may not get the right size. Best of all would be asking any training partners who also wear spats, or checking reviews like this one to get an idea of the actual size. Should they come back in stock, the Mashuu 2.0 grappling tights can be bought here. Yeah I hated the anti friction band on the Estilo 4 prototype so glad they got rid of them. Btw the upper right thigh image is a amended version of my Mashu artwork that I had no involvementin and do not like. Oh yeah: almost forget to mention the monkey with a helmet was amended from something else you did, so I've added that in just now. Where was the original one again?